FARMING is all about the management of five key elements – land, water, equipment, capital and people, according to north west New South Wales mixed farmer and Nuffield scholar, Daniel Kahl. Daniel Kahl standing in cotton at Glenco, Wee Waa, NSW. Business strategies are based on creating the best return on all these resources and, more often than not, it’s the availability of water that drives farming decisions. After expansion in his family operation at Wee Waa and helping to restructure their farm management, Mr Kahl set out to explore the limitations around the fifth element, people. 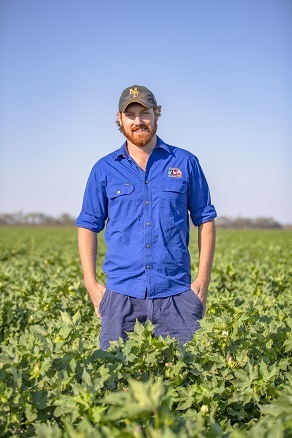 Supported by Cotton Research and Development Corporation and Cotton Australia, Mr Kahl received a 2017 Nuffield Scholarship to examine ‘the missing middle’, a term highlighting the gap in middle management to support both decision-making and practice change on the land. “I wanted to understand how the many existing programs around the world attract, upskill and retain talent in agriculture and, in turn, how these programs create a clear pathway that engages the next generation of farmers, setting them on their way to a long-term career in agriculture,” Mr Kahl said. One of the report’s key recommendations highlights the need to increase exposure to agriculture in primary schools. “School children dream of being astronauts, firemen and rock stars because these are the careers they are exposed to at a young age that promise excitement and stimulation,” he said. Conversely, Mr Kahl’s report also looked at those who already have an inclination towards agriculture, ensuring they are given a head start and a defined career pathway. “In many countries, education takes young people away from the farm, both literally and figuratively,” he said. In his report, Mr Kahl referenced innovative programs such as Agribusiness Careers and Professions, situated in north west NSW, and Cotton Gap, an initiative developed by Cotton Australia. “Agribusiness Careers and Professions allows students to remain in school for the final two years of education, while spending one day a week working on farm, completing 800 hours of paid work as a trainee,” he said. “It’s a prime example of how we can capture individuals who are already inclined towards farming, ensuring they continue an education which is practical and served through an agricultural lens. According to Mr Kahl’s report, continuing to link education with an agricultural career remains crucial throughout tertiary education. On his travels, he visited United Kingdom poultry business, Faccenda Foods, which takes on five to seven graduate placements from Harper Adams University in Shropshire every year. “The graduates spend the third year of their degree working on farm or across industry, before returning to complete their fourth and final year,” he said. To complete the puzzle, Mr Kahl also investigated how those already working on farm are exposed to continued professional development and growth. “Future farm managers need a broad range of skills to be successful, however many won’t have the time or capability to undertake full degrees or courses in areas such as finance, business management or human resources,” he said. 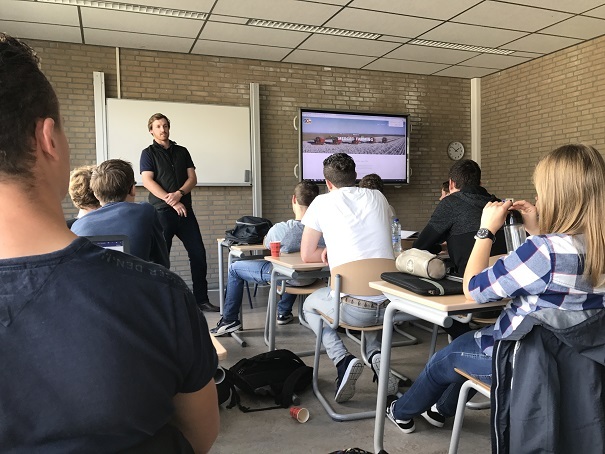 “I discovered some great examples of educational providers that are offering shorter, more specialised courses for farm managers, such as the ‘Applied Masters’ developed by faculty at the Aeres Hogeschool in the Netherlands. “The program requires farm managers to attend a number of short courses to upskill themselves in business management and financial planning in an applied manner and as often as possible on the farms where they are employed. Daniel Kahl speaking with Dutch students at Aeres Hogeschool in the Netherlands. Ultimately, what Mr Kahl discovered was not that the programs don’t exist to build human capital within agriculture, but these programs need to be better aligned to create a clear pathway to a career in agriculture. “The resolution of this issue is multi-faceted, but with the backbone of strong career pathways already in place across the world, I’m confident we will be able to connect the dots and set Australian agriculture on a strong trajectory into the future,” he said.